The two headlining features for this release include a new Layout Designer and an automated test recorder. The Layout Designer promises to be easier and faster to use while also producing more efficient layouts in the process. It accomplishes this with constraint layouts, which handle positioning and sizing all in one control so it won't have to nest several containers to achieve the desired effects. This should also help to ensure layouts are more portable across many different screens. Automated testing is about to see a huge step forward thanks to a new test recorder feature. Developers will be able to start a recording and start using their app. As each action is performed, it is turned into Espresso code that can be played back across a number of platforms, including Google's Cloud Test Lab. This will likely cut time to write tests to a tenth of what it took in the past. A few new tools have also been built with the purpose of analyzing various stages of a project to help diagnose potential issues. Among them there is an APK Analyzer that can point out resources that may be inflating sizes, a layout inspector to help with identifying things like excessive nesting, and more code analysis for locating possible problem areas. NDK developers haven't been forgotten. Google has been working on improvements for C++ support. Many developers have also expressed a desire for build systems other than Gradle, so the Tools Team has added support for CMake & NDK Build to Android Studio. 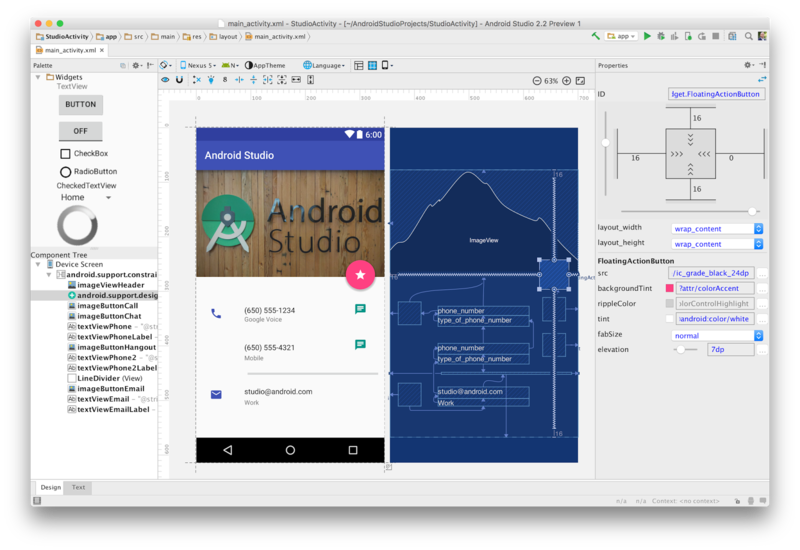 Like all updates to Android Studio, there are also a host of performance improvements and other bug fixes packed in this version. To begin with, the base platform has been updated to IntelliJ 2016.1, the latest version available from JetBrains. Compile speeds and runtime performance should be faster than previous versions, in part thanks to continued work on the Jack compiler and enhanced Java8 support. The Tools Team is also working to make Instant Run more effective and useful in additional situations. These features and more will be discussed in greater detail tomorrow during the "What's new in Android Development Tools" session. Google has decided not to allow a direct update via patches from previous versions to version 2.2 Preview 1 because it may cause too many problems for existing projects. For now, it is suggested that developers interested in trying out the latest version should download a full install of the IDE and run it separately from their existing installations. Instructions and downloadable packages are available here.